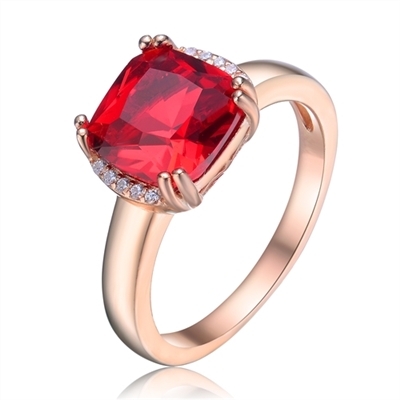 Diamond Essence Designer Ring with 2.5 carat Ruby Cushion Essence in 8 prongs setting and delicate melee set on two sides of cushion essence for additional beauty. 2.60 Cts.T.W. in Rose Plated Sterling Silver. Diamond Essence Designer Ring with 2.5 carat Ruby Cushion Essence in 8 prongs setting and delicate melee set on two sides of cushion essence for additional beauty. 2.60 Cts.T.W. in Rose Plated Sterling Silver.